Okay, so I am going to be honest with you all: I have a slight obsession with candles. Don’t we all?! I have always wanted my home to smell amazing, especially as I have a puppy and dogs do not always smell that great. The two things that I do not like about most big box store candles is that they are made in containers that I often won’t reuse and that they often feel chemically. I have been making an effort in my daily life to reuse, recycle as much as possible, donate, buy more naturally made goods and thrift when possible. And let’s be honest, the Glad candles one can get at Safeway, Coop, etc do not quite scratch that itch. So I am over the moon that we now carry Rinse and Repeat Candles, here at Outside the Shape. Rinse and Repeat is a company that is based right here in Calgary. 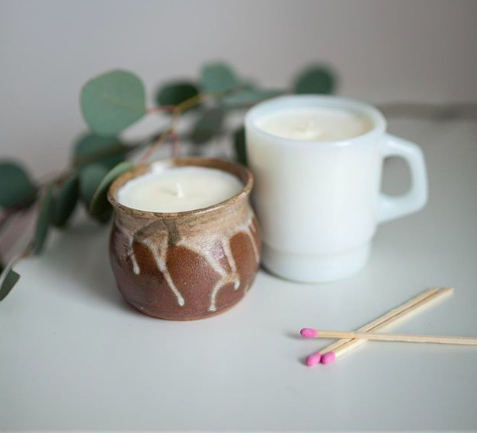 The owner, finds one of a kind vessels in thrift stores around town, and hand pours candles in small batches with a scented soy wax. Amazing right? She has created 10 different scents to choose from. Some of my personal favourites are Scorpio (Black Amber + Cherry + Almond), Gather (Cranberry + Cinnamon + Apple + Vanilla) and Girl Gang (Cotton Candy + Lime + Strawberry). But honestly, there is a scent from everyone, which I highly appreciate. It is incredibly satisfying that these candles come in a unique vessel, which I can reuse when the candles has run out! OR I can refill the candle through Rinse and Repeat’s refill program! No waste = happy Emilie. To see what other amazing scents Rinse and Repeat has created, head over to her website https://rinseandrepeatshop.com/or pop by the store to smell them in person!